The Northern Territory Cattlemen's Association (NTCA) has launched an online network for alumni of the NTCA Indonesia Australia Pastoral Program (NIAPP). The annual program which started in 2012, has seen groups of animal science students from Indonesia spend two months in the Northern Territory, learning and working in the cattle industry. The students complete an intensive pastoral industry training course, including animal handling and animal welfare, and then spend six weeks on a Territory cattle station. The NTCA have now established a custom website for alumni which will provide the infrastructure to keep graduates of the program linked. Following a very successful program in the 2015 mustering season, the NTCA with the Federal Minister for Agriculture and Water Resources, The Hon. Barnaby Joyce MP, have travelled to Jakarta Indonesia to launch the new alumni network. CEO of the NTCA, Tracey Hayes, said that the NIAPP was a great medium for both the Australian and Indonesian cattle industries to share knowledge and develop further relations. “Indonesia is a great trading partner with Australia. The alumni program that we launch today will ensure strong bonds between our two countries that will continue for many years,” Ms Hayes said. “Each year we host a new bunch of students and we don’t want to lose those connections. Every student selected for the program is studying animal science with a view to working in the cattle industry and we want to make sure those links are not lost. "Since the program first started, four years ago, we have had 54 students go through the course. Having a formal alumni network will help those students develop study and job opportunities, remain up to date with research and industry developments and involved in Australian and Indonesian Government initiatives. “We are immensely proud of this program and what it has already achieved. We hope to inspire these students and strengthen the cross industry relationships in Indonesia and Australia." 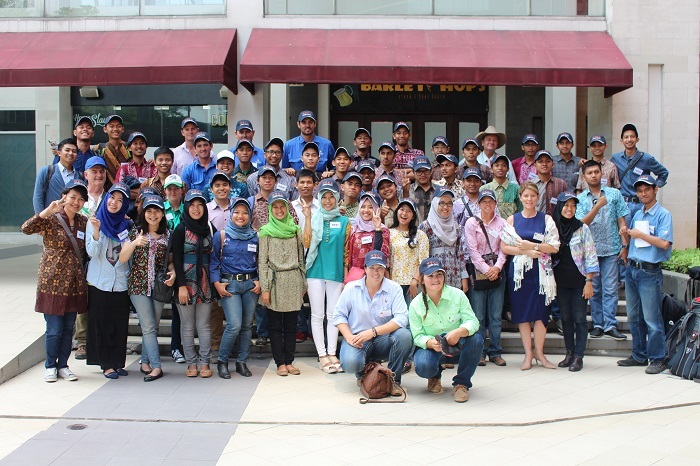 Minister Joyce said that the Indonesia–Australia Pastoral Industry Student Programme was just one element of the great work being undertaken under the $60 million Australia–Indonesia Partnership on Food Security in the Red Meat and Cattle Sector. “Australia understands the high importance that Indonesia attaches to building up its cattle industry and beef production as a key part of strengthening its long-term food security. Australia supports a number of development assistance programs which aim to support Indonesia’s goal of lifting its agricultural productivity and food security. “It’s a great example of how our two countries are working together to deliver mutually beneficial outcomes for our important cattle industries. “I commend the NTCA for their work in making this programme such a huge success and I’m confident that the benefits to both Indonesia and Australia will be felt for years to come,” Minister Joyce said today.